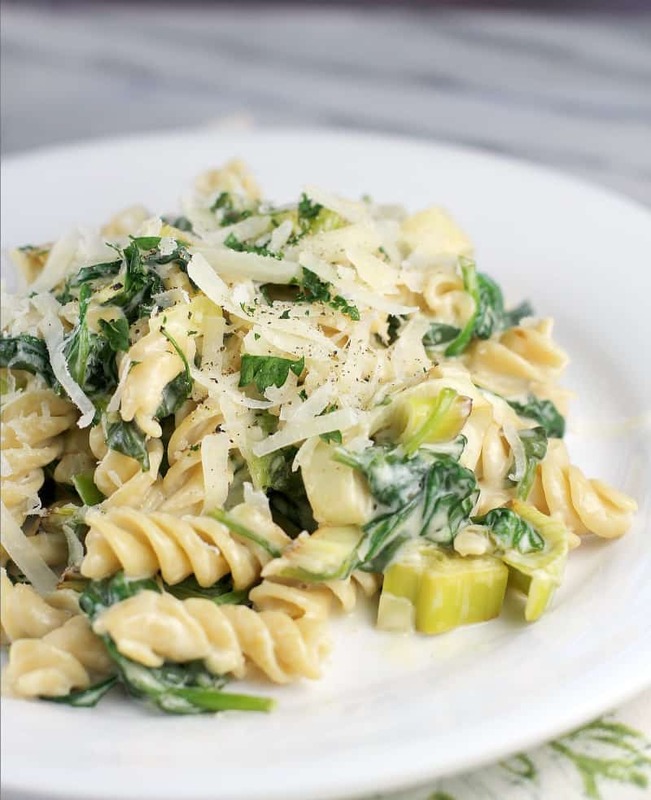 Everything you love about creamy alfredo pasta, in a gluten-free recipe made special with leeks and spinach. 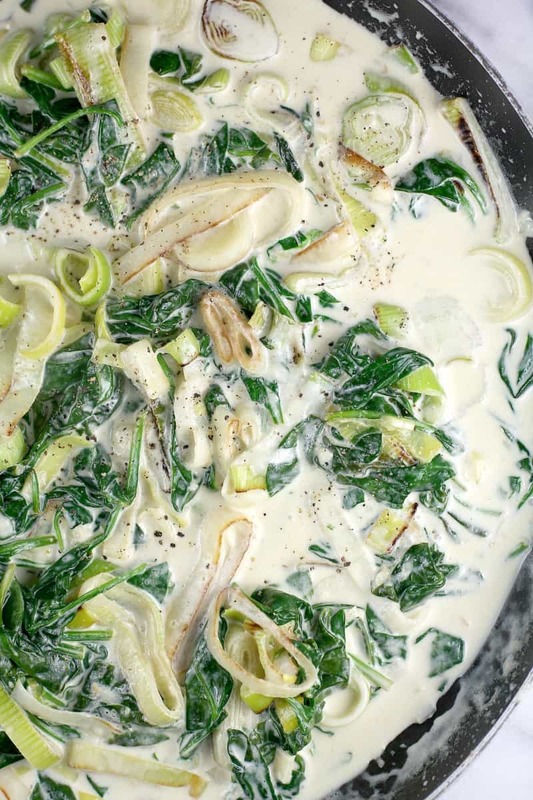 If you have ever wondered what to do with leeks besides soup, this recipe is for you. Now, I am not claiming that this is healthy by any means, but it is delicious, packed with protein (25 grams!) thanks to chickpea pasta, vitamins from spinach (141% RDA vitamin A), 8 grams fiber, gluten-free, and lovingly decadent. Yes, lots of nutritionally great things going on here, but there’s still calories, so I keep the portion size on the low side. Figure a cup per person. Not a big meal, but a great meal and that keeps it under 500 calories. And with the protein and fiber, it is filling too. So why gluten-free? I don’t avoid gluten, per se. 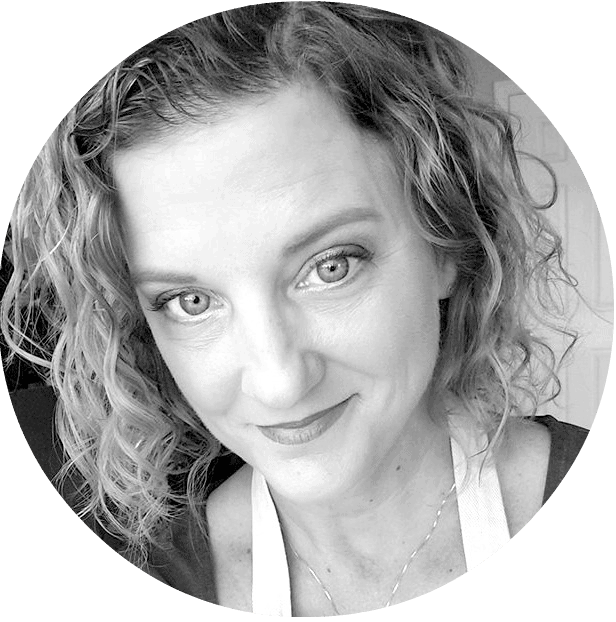 I went through a very short phase of avoiding gluten at the end of last year because I suspected it might be messing with my hormones (perimenopause ya’ll. don’t recommend it), but alas I couldn’t keep that up. But this is New Year, New Me talking and I got goals. This year I am registered for Ironman 70.3 Haines City, Florida, in April and Ironman Florida in November. So with all the training that will go into those races, I really wanted to try chickpea pasta as a way to get in carbs and protein at the same time. Because when I trained for Ironman Louisville, pasta was life. So, that’s all I’m up to here. Looking for a healthier pasta whether or not it has gluten. This one does not, so you celiacs and gluten intolerants can join on in. Chickpea pasta is the first GF pasta I have tried, and I have to say it passed the taste test. I picked it up in the regular pasta section of my grocery store, and I found it fairly reminiscent of whole wheat pasta. The texture is slightly different, but not by much and I have nothing negative to report whatsoever. And chickpea pasta has protein. Lots of it. What to do with leeks besides soup? Not that soup is bad. I’ve even made soup with leeks. But that is not all leeks have to offer by far. Leeks are a little bit onion and a little bit scallion. They are in that onion-y family, but are freakishly large and have much milder flavor. Leeks grown in sand, so you have to wash them carefully to get rid of the grit. The white and light green parts at the bottom near the root are the edible part. Discard the tough, dark green portion. Onions, leeks, shallot, and green onion are not considered interchangeable in recipes (though I use onion for shallot all the time, oh well). Just be sure to use what the recipe calls for. Leeks are just lovely. Obviously they pair well with potato and that’s why there are a gazillion potato-leek this-and-that recipes out there, but leeks are much more versatile (and I dare say underappreciated) than that. What to do with leeks besides soup? Put sauteed leeks on pizza. Add leeks to scalloped potatoes Because again, leeks and potatoes are classic. Saute up leeks with mushrooms for a simple side dish. Leeks even on their own make for a lovely gratin. Add leeks to spanikopita! How fun is that. Throw in leeks next time you roast veggies or make a sheet-pan dinner. 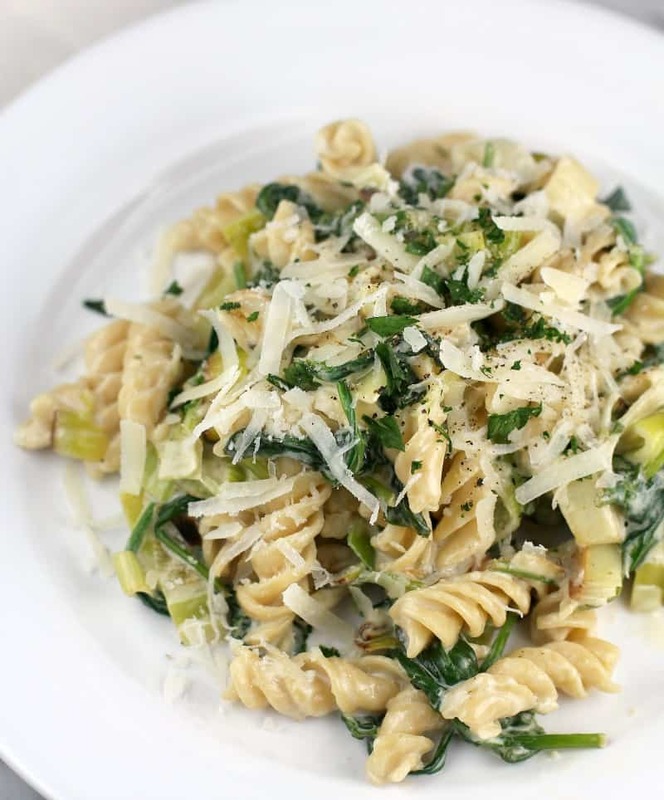 Add leeks to pasta like in my Spinach and Leek Rotini here. Recipes with leeks, the possibilities are endless and they give you an easy way to posh up a recipe and make it more interesting. Cook the pasta on the lower end of the timeframe given in the directions to keep it al dente. 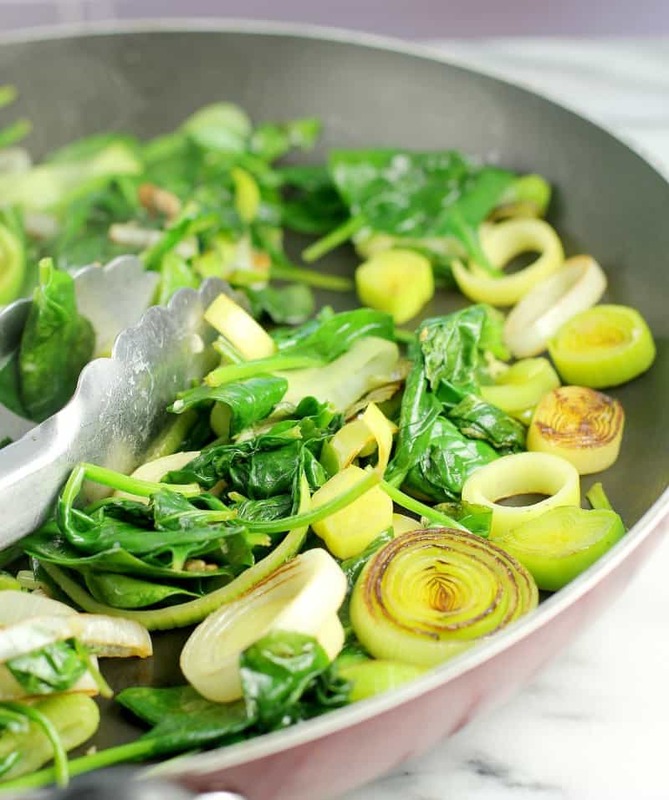 A nonstick pan works better for sauteing the leeks, spinach, and garlic so we can get away with using a little less oil. Do not let the cream thicken too much. We just want it slightly thickened because adding both the parmesan and pasta will thicken it further. Taste for seasoning! 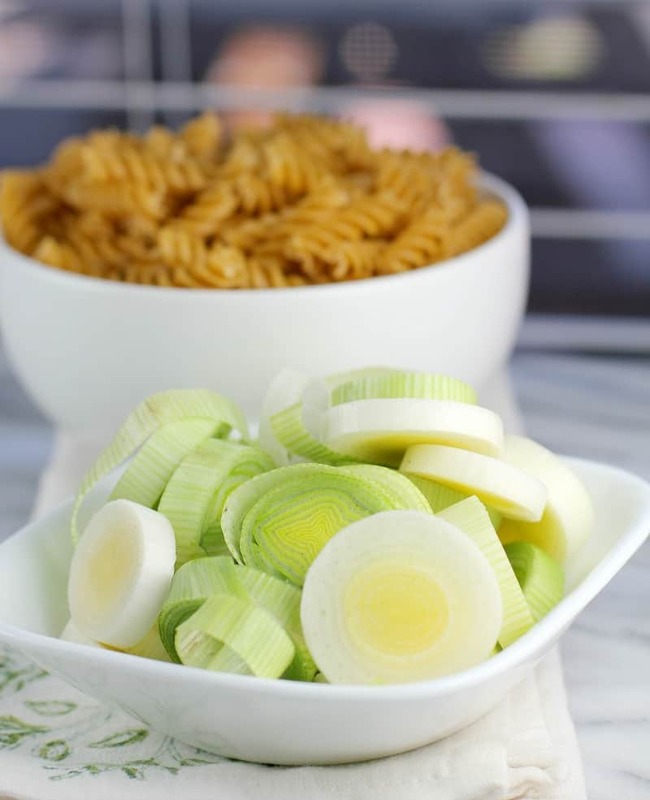 I recommend doing this before and after adding the rotini. And check this out — this recipe is ready in 15 minutes. FIFTEEN minutes. Because this is a super simple cream sauce that cooks in the time it takes to boil the water and cook the pasta. So there we are. So that’s it kids! 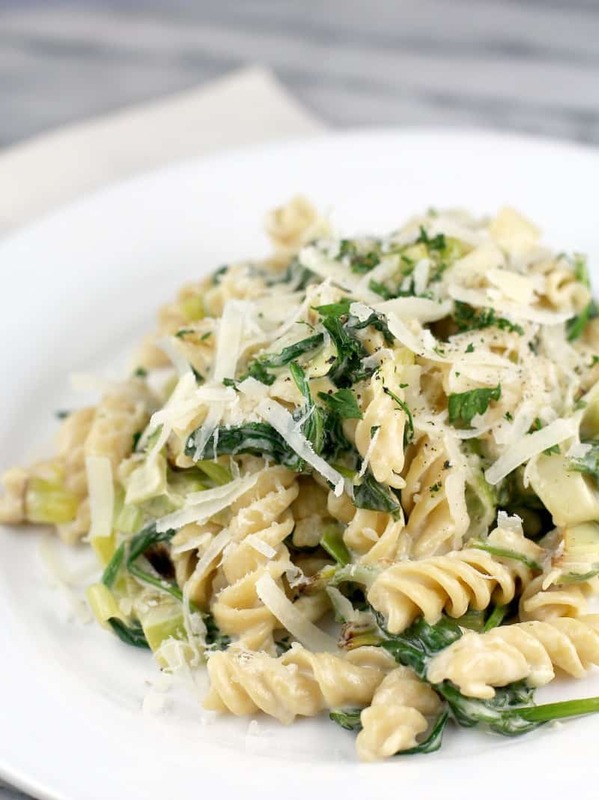 Creamy, not-so-damaging Spinach and Leek Rotini goodness. A great way to get protein and spinach into your kids, and an easy way to introduce your family to leeks. 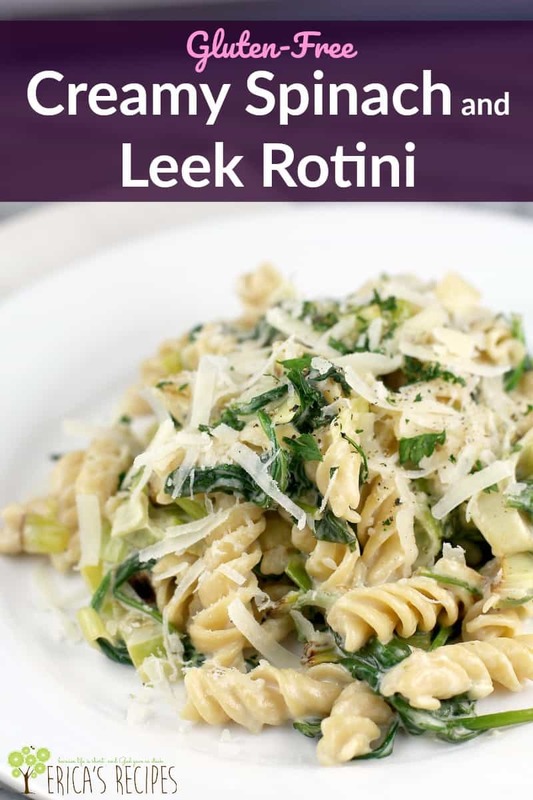 What to do with leeks besides soup is to make Creamy Spinach and Leek Rotini. Ready in 15 minutes! If you have ever wondered what to do with leeks besides soup, this recipe is for you. While the pasta is cooking, prepare the sauce. Heat the olive oil over medium-high heat. Add the leeks and saute until lightly golden. Add the garlic and spinach. 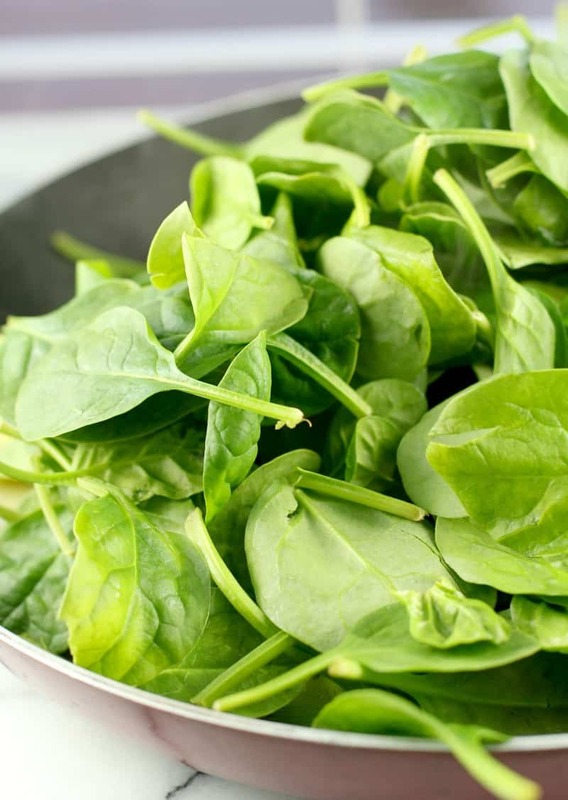 Toss and turn the ingredients until the spinach is all wilted and garlic is fragrant. Add the cream and cook over medium heat until slightly thickened. Add half the cheese. Season with salt and pepper. Toss in the pasta. Serve topped with remaining cheese and garnished with parsley. This looks so fresh and tasty! 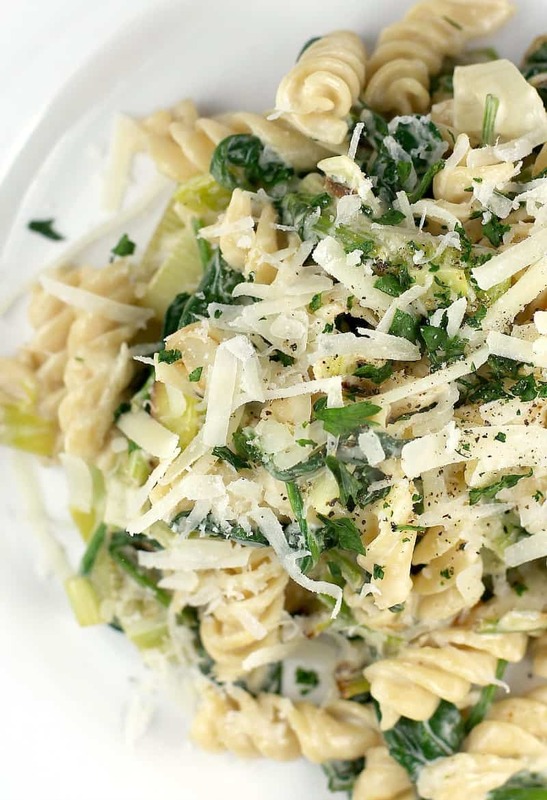 I don’t often cook with leeks, but incorporating with pasta really sounds perfect! I love leeks! They have such a great flavor especially with cheese! Looks so creamy, comforting and delicious! Can’t wait to try this for dinner! 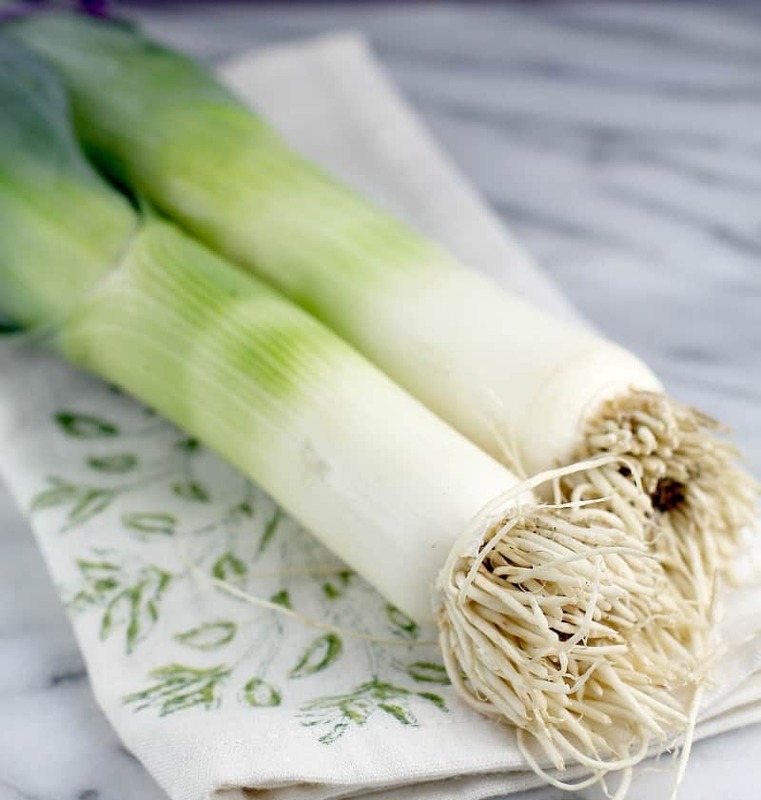 Never cooked with leeks..Will need to try this out! 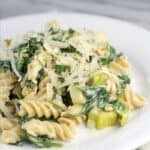 I love the idea of making this creamy spinach leek rotini. I have some spinach and been wondering what to make with it. Any meal that you can keep under 500 calories is a win in my book. That’s less than a burger at fast food! I’m preparing myself for a transition to a gluten-free lifestyle. This will make it so much easier … and tastier. This recipe is so easy to follow. I am making this tomorrow for my family. Perfect for our Pasta Fridays. My children would love this. I love this so much! I have to be gluten free and I’m always looking for new recipes. I’ll pin this to try.